So as per my last post, I’ve been playing around with my weblog a bit. I’ve upgraded to WordPress 2.7, which features a completely overhauled administration dashboard. 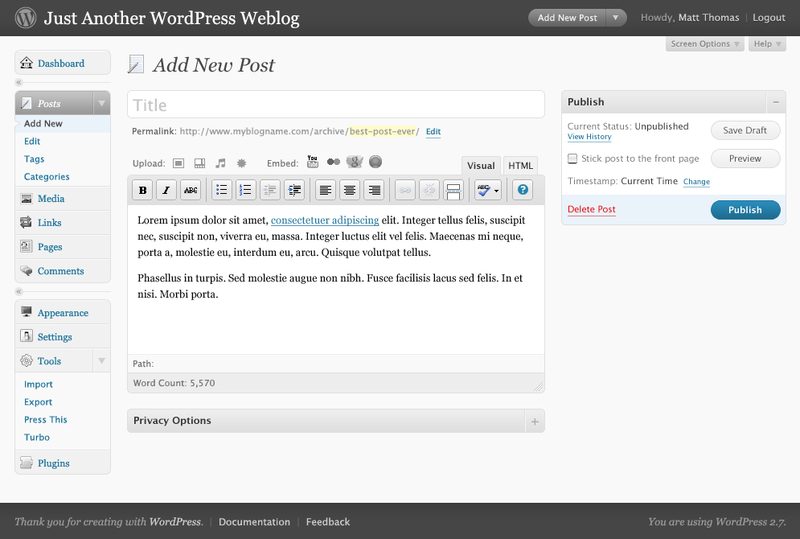 In addition, threaded comments are now built into WordPress, so there’s no need for a plugin. I just needed to hack my theme a little bit to take advantage of this feature. I’ve done a minimal job, so threaded comments don’t look that great at the moment. I’ve added some test comments in the comments section below. Another thing I’ve done is fully widgetize my blog. So everything that used to be hand-coded into the various PHP files that make up my theme is now a widget (Twitter feed, Google Analytics and so on). This makes everything much easier to maintain, and change, if I feel like it. In related news, AJ has made the switch to WordPress from Blosxom. I’m pretty sure he won’t look back. I’ve been using WordPress since mid-2005, and I reckon WordPress is getting better with every release (2.7 in particular is a pretty big step in the right direction, IMHO). It’s very well supported, has a large user community, and it just works. Fantastic. Update 29 Dec, 2008: I’m now using a variant of Chris Harrison‘s threaded comment styling. He’s written a tutorial on how to style your comments. This entry was posted in Random observations and tagged blog-meta, comments, friends, wordpress. Bookmark the permalink. This is a top level comment. And this is a reply to a top level comment. I’m glad you found what I had done helpful! purchased, and left the store.